Okay, let’s get to the announcements! As you saw above, Hatakeyama-san cranked out yet another fantastic holiday wallpaper for your enjoyment! This time we have just the members of The Seven enjoying a meal together in way that only The Seven could. Of course Desna has her Tarot cards on the table, and with Teseo busting out the selfie stick (cuz OF COURSE Teseo has a selfie stick), Ghauri has to make sure he strikes a sweet pose. 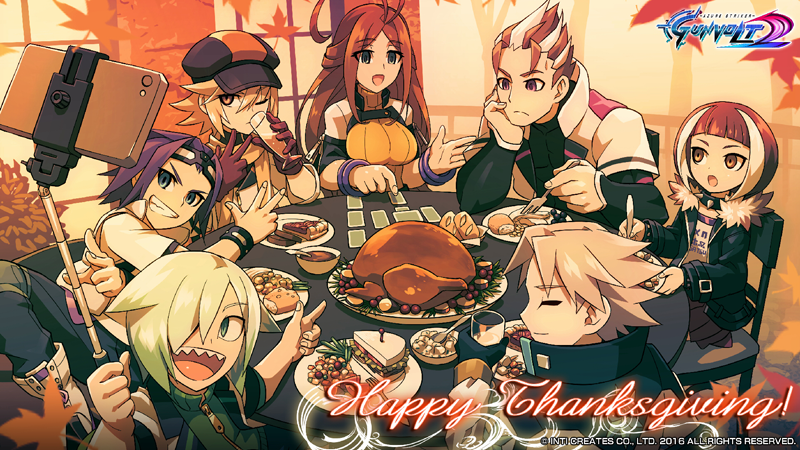 Download the Gunvolt 2 Thanksgiving wallpaper from the official GV2 website. The arrival of Black Friday and Cyber Monday mean it’s time for another sale! There’s no better time than now for you or your friends to add Azure Striker Gunvolt to your library. As part of the Nintendo Cyber Deal sale, both Azure Striker Gunvolt and Azure Striker Gunvolt 2 can be had at a discount! The sale runs until December 5th. As you can see from the image above, Azure Striker Gunvolt will also be a part of the legendary Steam Autumn Sale as well. The Autumn Sale runs until November 29th. Speaking of Gunvolt on Steam, a familiar mode from last year is coming back, and it’s better than ever! 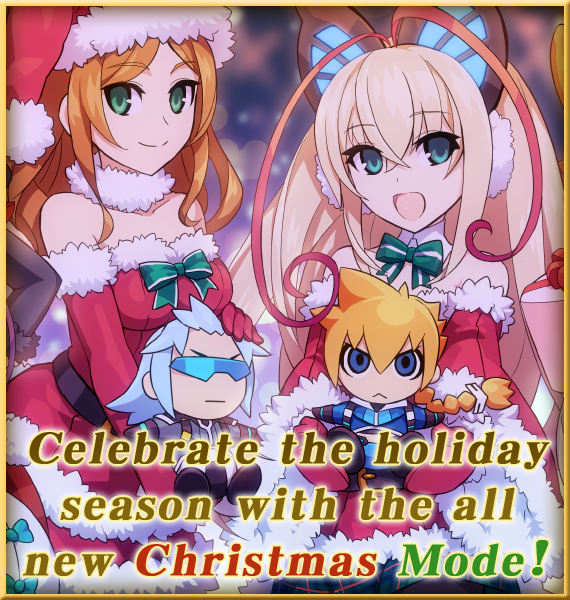 New “Christmas Mode 2016” Added to Gunvolt Steam Ver. 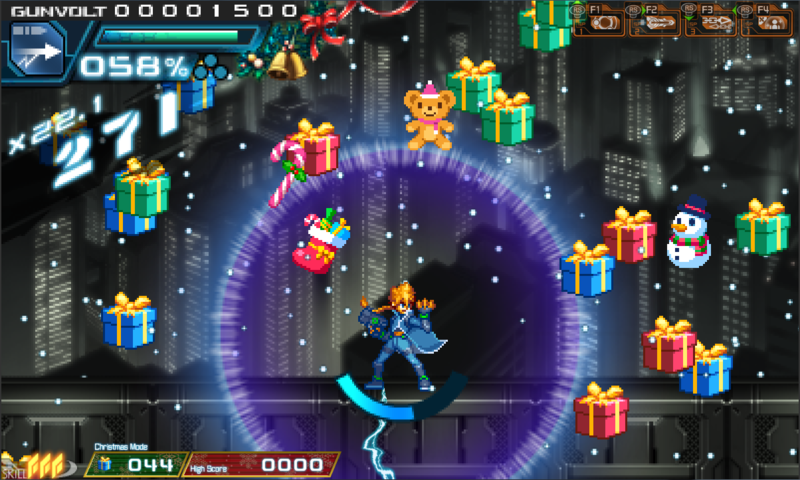 Winter has arrived in the world of Azure Striker Gunvolt once again, and the stages have Christmas presents raining from the sky! Shoot or zap the presents to open them up, and collect the various gifts that pop out from them. The chilling cold has frozen all the stages and made the floors very slippery too, so watch your footing as you take down enemies, collect presents, and make your way to the bosses! Presents will rain down only during specific times throughout the stage, although they particularly rain down like crazy after you destory a Hexapyle. There are other instances where presents will rain down too. For example, when the last two digits of your score are the same number, it will release a whole bunch of presents. There are other things that trigger presents too though, so keep an eye out for them! Your total amount of presents will be tallied after you complete the opening stage and the six boss stages (Merak, Jota, Viper, Carrera, Elise, and Stratos), so collect as many presents you can and get your name up on those leaderboards! We also made a new Christmas BGM song that will make you feel all light and fluffy inside, so we tweaked the jump mechanics a bit to reflect this feeling too! We hope you enjoy the whole new feeling that mid-air battles will take on, and a lot more, in Christmas Mode 2016! Here’s the new Christmas Mode in action! There you have it, Strikers! 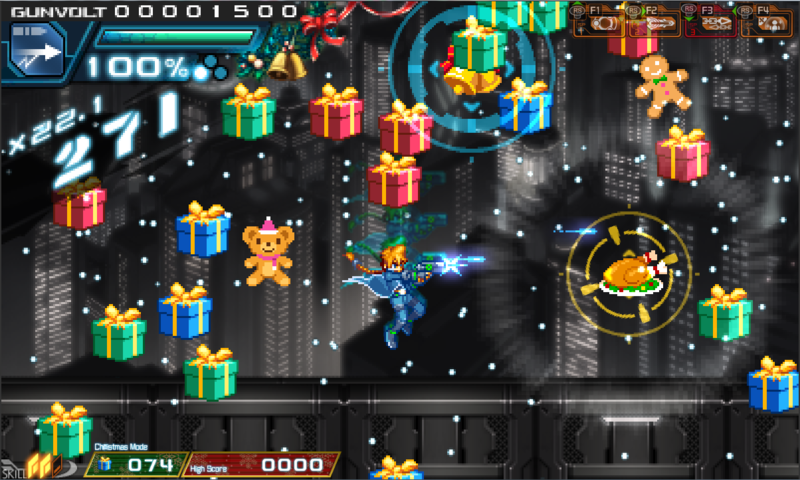 We hope all this Gunvolt goodness enriches your holiday season, and that you have a fantastic Thanksgiving!